Mountain flight is the perfect option for those who have limited time but wants to enjoy the Himalaya. 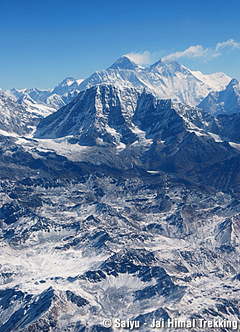 The flight takes you up to 25000 feet above the sea level in the glorious Himalaya region. All passenger have window seat and opportunity to see mountains in going or return way equally. In few minutes after taking off from Kathmandu Airport, you will have panoramic view of Great Himalayan Range. In 20min, you will reach to close to Mt.Everest area. Here, you will see many other mountains and glaciers, valley. During the flight, also you will have chance to enter Cockpit to enjoy "Pilot view" and take picture. Although this flight is very much depends on the weather, but why don't you take a chance? 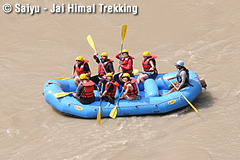 Few rafting rivers in the world can match the thundering course of the rivers of Nepal originating from the snow meltdown the Himalaya. The river gush through the twisted canyons, winding through calm valleys where small settlements are perched on the banks, timing out only as they spill out into the Indian plains of merge with the Ganges. The river trip is one of the best way to explore the typical cross-section of the country natural as well as the ethno-cultural heritage with massive doses of adrenaline buzz in our world caliber white water thrills. On the way to Kodari Border there is a place called Bhotekoshi where you can see the place for Bungy Jumping. The place is 3 hours drive from the Kathmandu. You have to give a jump from 160m high which is one of the largest free fall in the world. The bungy junping is designed, constructed and operated by a very well experienced Kiwis for the exciting standard, and for your safety too. The bridge is designed by Swiss and made especially for bungy jumping only, with a 4x safety factor, the bridge has a loading factor of 41500 kg. This is a one day programe, and you can come back Kathmandu on same day . Paragliding is done only in Pokhara. ( You have to take 25min flight or drive for 6 hours from Kathmandu). Paragliding is a two days programe. For Paragliding there is a beautiful place called Sarankot where you can also see the sunrise and beautiful view of Annnapuruna Mountains. Well experienced pilot will takes you on a unforgettable journey. The starting poing of Paragliding is Sarankot and and your landing point will be Phewa lake. The duration of fly will be approximately for 3o minutes. The pilot of Paragliding are foreigners.